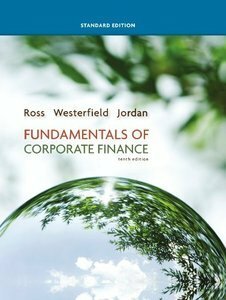 The best-selling Fundamentals of Corporate Finance (FCF) has three basic themes that are the central focus of the book: 1) An emphasis on intuition-the authors separate and explain the principles at work on a common sense, intuitive level before launching into any specifics. 2) A unified valuation approach-net present value (NPV) is treated as the basic concept underlying corporate finance. 3) A managerial focus-the authors emphasize the role of the financial manager as decision maker, and they stress the need for managerial input and judgment. The Tenth Edition continues the tradition of excellence that has earned Fundamentals of Corporate Finance its status as market leader. Every chapter has been updated to provide the most current examples that reflect corporate finance in today's world. The supplements package has been updated and improved, and with the enhanced Connect Finance and Excel Master, student and instructor support has never been stronger. Connect is the only integrated learning system that empowers students by continuously adapting to deliver precisely what they need, when they need it, and how they need it, so that your class time is more engaging and effective.